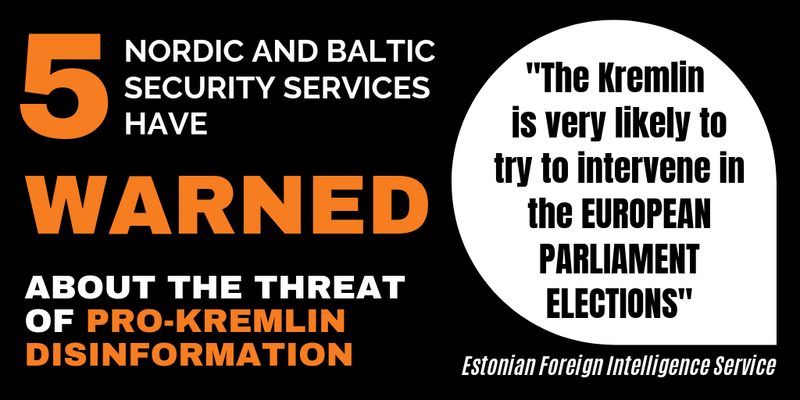 The notion that Western countries themselves run state-orchestrated disinformation campaigns is a popular pro-Kremlin defensive line. 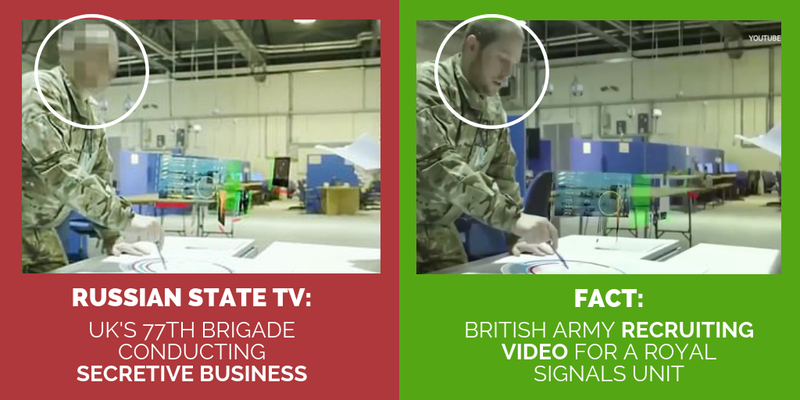 In an apparent attempt to produce evidence in support of this claim, Russian state TV Pervy Kanal decided to portray the British armed forces 77th Brigade, which defends the UK against different kinds of hybrid threats out of barracks in Hermitage, Berkshire. However, Pervy Kanal’s report, which was broadcast in the evening news programme Vremya on 22 November, ended up more like not just one, but a total of three own goals. Here’s how the journalists at Russia’s independent TV Rain challenged their government-controlled colleagues’ narrative. 1. As an illustration in the report about the 77th Brigade, Pervy Kanal showed British military personnel at work. However, the footage is taken from a British Army recruiting video and does not show the 77th Brigade, but a Royal Signals unit, as also noted by Daily Mail. In order to make the footage look secretive, Pervy Kanal blurred the faces of the soldiers and officers in the video; in the original recruitment video, the faces were shown openly (see the above illustration and TV Rain’s report from 03:34). 2. Pervy Kanal’s report is largely based on an article about the 77th Brigade published by the magazine Wired, which the Pervy Kanal also references. 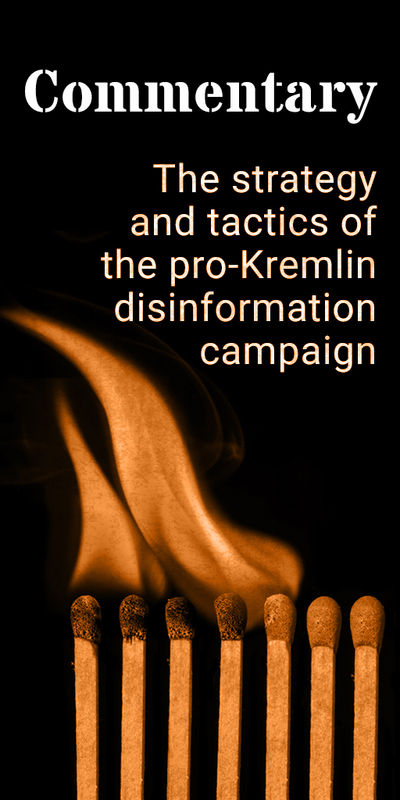 However, TV Rain underlines that Pervy Kanal’s claims that the 77th Brigade produces and spreads “fake news”connected to e.g. the downing of Flight MH17 or chemical attacks in Syria are not confirmed in Wired’s material. 3. Finally, TV Rain has looked at how Pervy Kanal reacted to an alert notice from the British Army, warning its personnel against talking to its reporter following his video recordings outside the 77th Brigade’s barracks for Pervy Kanal’s news broadcast. TV Rain criticises their state TV colleagues for overselling this as a major national sensation in the UK (“even Brexit has faded into the background”, Pervy Kanal reported in a follow-up article to the news brodcast) and as a violation of the correspondent’s rights, when he has in fact, at least so far, not been formally charged by British authorities. TV Rain ends its report about Pervy Kanal’s news item by reminding its audience that “sometimes desperate adversaries of the British crown, who work for Russian state TV channels, themselves become subjects of Her Majesty” – a fact we also took note of a week ago.